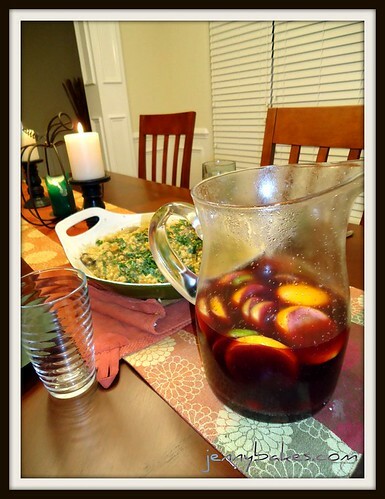 I had this sangria recipe before, at a friend's house, probably for one of the international dinner nights she hosted. I remember going there one day after work to drink the leftovers. This sangria is not kidding around! Orange juice, lemonade concentrate, brandy, triple sec, sliced lemon, orange, and lime, and maraschino cherries floating around in there. I made it Wednesday afternoon and let it chill over 24 hours, which is essential for a good sangria. The wine I used was a pretty full-bodied Bordeaux from Chateau Bel Air. I know, I should have used Spanish red wine, but I had this on hand and it worked great. The sangria recipe includes some optional ingredients - sugar, which I added because of all the citrus elements, but I don't really think it needed it. It also says you can serve it with carbonated water, but I wanted it to drink more like wine and less like fizz. I think that was a good decision. I think if I had not cared about making it husband friendly, I might have made it more Thanksgivingesque by pouring cranberries into the glass. Even if they wouldn't add flavor, they would look pretty! Then on to the paella. I had never made paella, largely because I kept reading that it isn't paella without the pan. 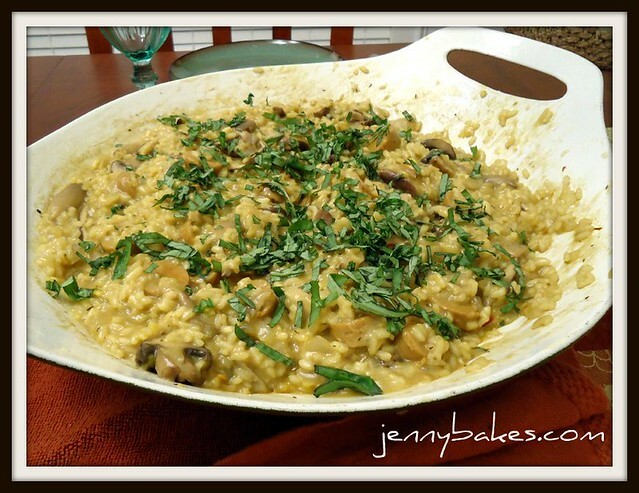 I'm lucky to work with a bunch of librarians who are also foodies, so when I sent out an e-mail asking if anyone had a paella pan, I was not disappointed. As far as following the recipe goes, the first change I had to make was to find a substitute for chicken stock. I originally purchased vegetable stock, but ended up using mushroom to really emphasize the flavor of the mushroom. I do think that is why the saffron color is not as vibrant as it is in many paella pictures I've seen, since mushroom stock is around the color of beef stock, and tends to muddy up the color. Taste-wise, the decision was a good one. The recipe also called for ham, which I obviously wasn't going to use. We had recently tried these field roast frankfurters, a vegan meat substitute, that were reminiscent to me of polish sausage I'd grown up eating. While it might look like hot dogs in there, which would be unappealing, the flavor was much more complex. I think having a protein in there really made the dish more of a meal and less of a side. (After all, traditional paella is usually chock full of seafood and meat). Since we go vegetarian but not vegan, I was still able to add the butter and manchego at the end. You can't see them in the dish, but the final creamy and glossy texture is definitely due to those two ingredients, and the cheese adds an incredible flavor dimension. 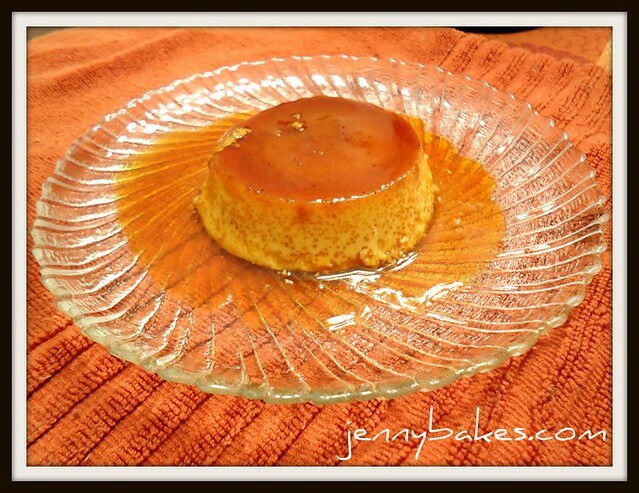 The last recipe for the meal was a pumpkin flan. Is there anything more Spanish for dessert? I had several different recipes bookmarked, one which called for cream cheese, but then on the 2011 Thanksgiving recipe index put together by the guys over on The Bitten Word, I found a newly published recipe for individual pumpkin flans from Bon Appetit. The recipe is great, flawless even. This baker, on the other hand, is incredibly flawed. I had exactly enough sugar on Wednesday night to make the caramel, so of course I completely destroyed it. My brave and calming husband Nathaniel went to WalMart on Thanksgiving day to buy more sugar, and I tried it again. And... again. I finally figured out that I was being too timid; that the sugar really needed to be cooking on medium-high to get to that amber color without too much crystallization. Or it could be that as I scrubbed the burnt sugar out of the pan the second time, I gave an edict to the evil kitchen god of caramel, my nemesis. Whatever, it worked the third time, and the custard mixture was all ready to go in the fridge. Unfortunately, that isn't the last time I was thwarted. I was so worried I'd underbake that I overbaked these a tad. You can see that above in the little dots. So they ended up tasting a little eggy and not quite as creamy as they should have. Definitely bake these closer to the 20 minute time than 25, I'd say. And maybe remove them from the water bath earlier than I did. Still, you could taste the subtle pumpkin and steeped spices, which paired nicely with the caramelized sugar, a light and not too sweet ending to a Spanish Thanksgiving feast!